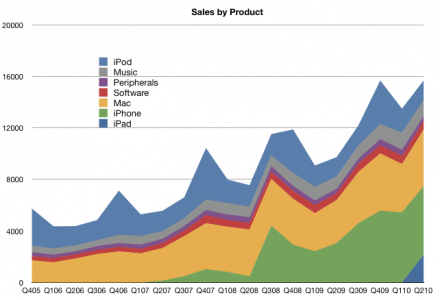 The following chart shows the value of sales per quarter (in $million) since the beginning of 2005. What’s interesting to note is that more than half of sales is contributed by products which did not exist three years ago (iPhone and iPad). Music and iPod did not exist 10 years ago. It’s entirely appropriate that Apple removed “Computer” from its name, though they still sell mostly computers of a different kind.